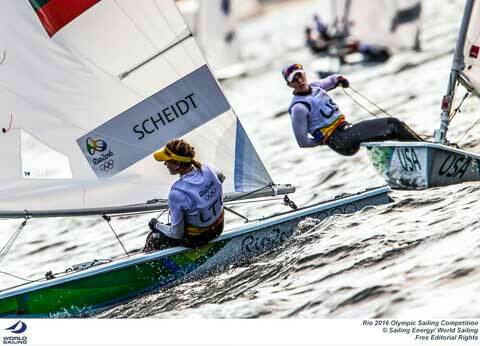 Powder Puff Sailing: Keeping up with the Olympics! Keeping up with the Olympics! 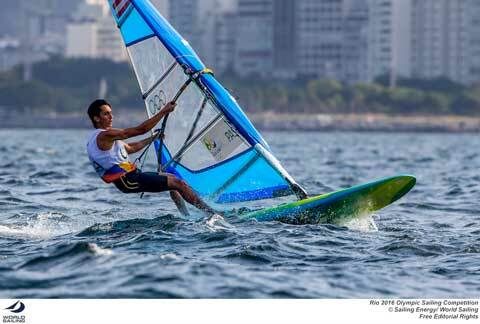 Winning Medals in Rio is going to be very hard in the challenging wind conditions off Rio de Janeiro. Day One showed us just how capricious the winds can be on every race course. Each day the classes move to a different circle. It will be difficult to master the changing wind patterns from one day to the next. The winds weave around the surrounding mountains and high city buildings. One moment you are sailing in 14 knots of wind, and then suddenly the wind just stops. Every boat experienced emotional highs and lows during the first races in the Lasers, Laser Radials, and Men's and Women's RS:X sailboard classes. To paraphrase former President, Bill Clinton, I could feel the sailors' pain. Overcoming adversity, so that one can consistently finish in the top ten in each race, will be the key to winning. The RS:X classes schedule three races each day over four days leading to the Medal Race. The top ten boats go on to the Medal Race. Medal Races are worth double points. Great Britain's Nick Dempsey got off to an impressive start with two firsts, and a second. He won the Silver Medal in 2012 in Weymouth, and is hungry for a Gold. Based on his performance he is on his way. In the Women's RS:X Division American Marion Lepert finished a respectable 10-3-10. 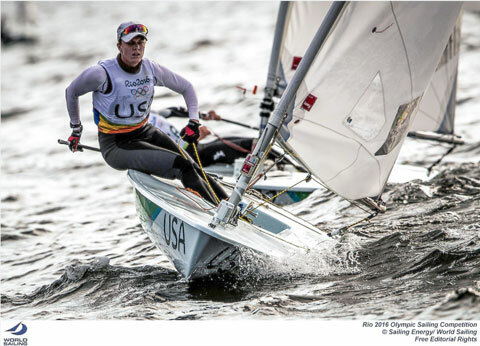 She is 20 years old and is sailing in her first Olympics. She looked comfortable in the moderate winds off Rio today. She grew up sailing on San Francisco Bay and is used to sailing in a strong breeze. The big test for her will be in light winds, which are forecasted later this week. The most interesting race of the day was in the Women's singlehanded Laser Radial Class. All eyes were on China's returning Gold Medalist, Lijia Xu. She has not been sailing for three years, concentrating instead, on earning a degree in Naval Architecture at the University of Southampton in England. In Race One she finished third. America's Paige Railey finished 15th in the first race, and came back strong in Race Two. The wind on the race course was shifting 30 degrees and ranging from 14 knots down to four knots at times. Railey got off the line with a clean start, and was running between sixth and tenth on the first leg. 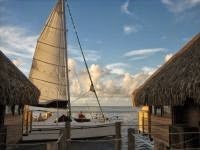 She avoided getting tangled up with other boats and worked every wind shift. The Laser Radial tacks efficiently, so it is worth taking advantage of every wind shift. At the first mark China led the fleet, and Railey was in fifth. Croatia, Belgium and Lithuania's Gintare Scheidt were all in the top five. On the second beat back to the windward mark, Scheidt did a better job picking wind shifts and passed Xu. Railey sailed brilliantly approaching the same mark and moved into third. On the final approach Xu failed to cross Railey on port, and had to perform a 720-degree penalty. Railey moved into second all the way to finish line. The top seven boats in the Laser Radial class are all returning Olympians. Three of them have won medals, including Xu, Scheidt and Marit Bowmeester, NED (Silver 2012, London). The winner of Race Two, Gintare Scheidt, won a Silver Medal in 2008 in Quindao, China. 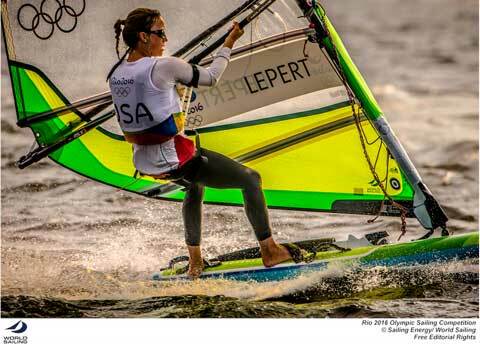 She is married to Laser superstar Robert Scheidt, BRA, who is racing in the Laser Class. At 43, he is the oldest sailor in his class, but also has five Medals — two Gold, two Silvers and a Bronze — that he earned from the last five Olympics. He opened with a 23rd in the 38-boat fleet, but quickly recovered to win the second race. Charlie Buckingham, from Newport Beach, Ca., had a 20th in the first race of the day in the Laser, and moved into seventh in the second race. The sailors drop their worst race of the series. 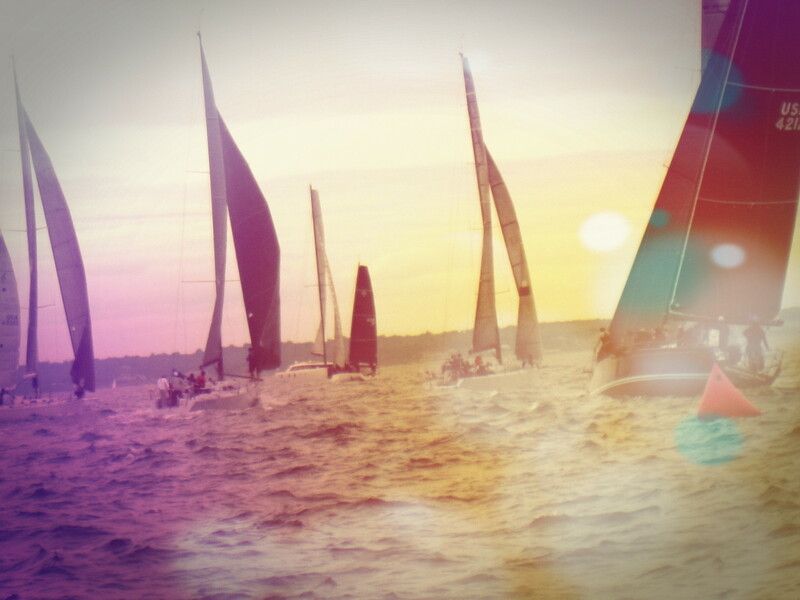 It is tough to have to drop your first race, because it means you have to sail flawlessly for the rest of the regatta. Both Scheidt and Buckingham will have to work hard to work into the top ten. The pictures coming off the water are riveting. You can see the determination on the faces of the sailors as they work their boats through the choppy waves off Rio. Both the RS:X sailboard and the Laser sailboats are provided to the sailors. Every piece of equipment, including the hull and the sails, are identical. It is the sailor who makes the difference. The wind certainly has an effect on the outcome. How a sailor deals with a bad shift or light spot is critical. You simply can't get upset when the wind disappears, or get too excited when luck into a great breeze. A positive attitude is important. Paige Railey avoided taking big risks and picked off one boat at a time. But it’s early in this regatta. The other six classes that start racing later this week are well aware of the challenges ahead. It will be great theater to watch. The outcome in every class is wide open. Our television coverage continues on Tuesday on MSNBC at 4:35 Eastern time. 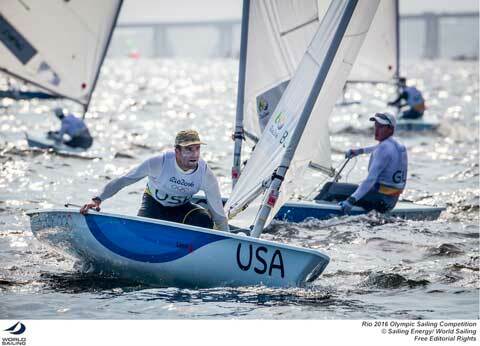 We will focus on the Finn and Women's RS:X. San Diego's Caleb Painemakes his Olympic debut, and Marion Lepert looks to extend her strong first day. Later this week, my co-commentator Randy Smyth and I hope to be able to add live commentary to the World Feed that is being broadcast on NBCOlympics.com every day at Noon ET. 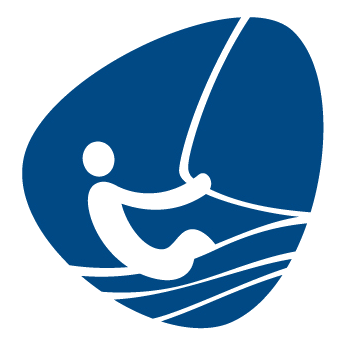 Be sure to visit OlympicSailing.nshof.org to read every day's report, plus additional info including Sailing Instructions and course maps.